Meet Your Liberator: Ernest Floyd Jr.
Major Organizers is proud to introduce our newest Liberator, Ernest Floyd Jr. 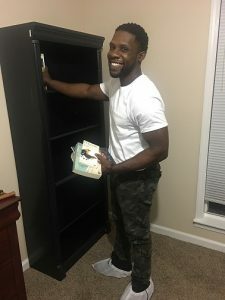 This 28-year-old Montgomery, Alabama native is breaking new ground: He’s Major Organizers first male Liberator! For the past six years, Ernest has been working in human services providing vocational support for the developmentally disabled, veterans and homeless populations. He recently began pursuing a degree in computer information systems. Now, he’s combining his love of all things efficient with his passion for helping others as he begins his career at Major Organizers. Q: How does it feel to be Major Organizers’ first male Liberator? A: It is a surreal yet overwhelmingly amazing feeling. I had no idea Major Organizers did not have any male Liberators. I am honored to be making history here. The possibilities are endless, and the sky is no longer the limit. Q: What drew you to a career in organizing? A: Hands-on problem solving attracted me to organizing. I love finding solutions to issues and working with my hands! It is an excellent way to keep my mind and body in shape. One of my fondest memories as a child was playing Legos. I do not know what I enjoyed more—building structures with my Legos or organizing and sorting them by color and size. Q: How do you get started when you tackle a new organizing challenge? Break down large attainable goals into smaller completable tasks. Whether it is a small step or giant leap, progress is progress. Never stop moving. Constantly visualize your goals. Speak them into existence. Whether it is on a sticky note above your doorway, written on a bulletin board or listed as a memo in your phone, make sure you can physically see and touch your goals. Use it as map on your journey towards success. Physically moving and organizing items is the easy part. The challenge lies within the consistency to stay motivated and inspired until the goal is achieved. Q: What is your favorite organizing product? A: I love stackable storage containers, especially if they have built-in drawers. I became addicted to these containers during my undergraduate years living on an extremely small budget. They are quite versatile and portable. Q: What is the most challenging part about becoming a Liberator? A: Being the first male Liberator presents a challenge for me. From my understanding, history has been made with me being here. It is a major deal, pun intended! All jokes aside, I know the expectation bar has been placed high, but I am ready for the challenge. I will have good and bad days, but everything will be fine as long as I have the continued support and encouragement of my teammates. I am here to liberate the community one household at a time. Q: What is the most rewarding part about becoming a Liberator? A: Helping people restore peace and balance in their lives. It is spiritually rewarding to be a witness and a part of person’s journey of positive growth. A: Some level of nervousness and anxiety is expected in regards to new experiences. It is part of the process and journey towards change. I assure you we take on every job with an understanding and non-judgmental mind. There is nothing to feel shame or embarrassment about. No one is perfect. Some people are too prideful to ask for help, and for you to be here took courage. I am honored to be serving you. We are here to guide and assist you through every step of this process. Upon its conclusion, you will have a deep sense of peace and rejuvenation. Q: What impact do you hope to make on clients’ lives? A: I wish to make a long lasting, positive impact on clients’ lives. I wish for the lessons I teach to be never forgotten.